Last year around this time I really doubted what I wanted to do in 2010. I was playing $15/$30 and filled up till 24 tables with some $10/$20, some more $5/$10 and if needed $3/$6. 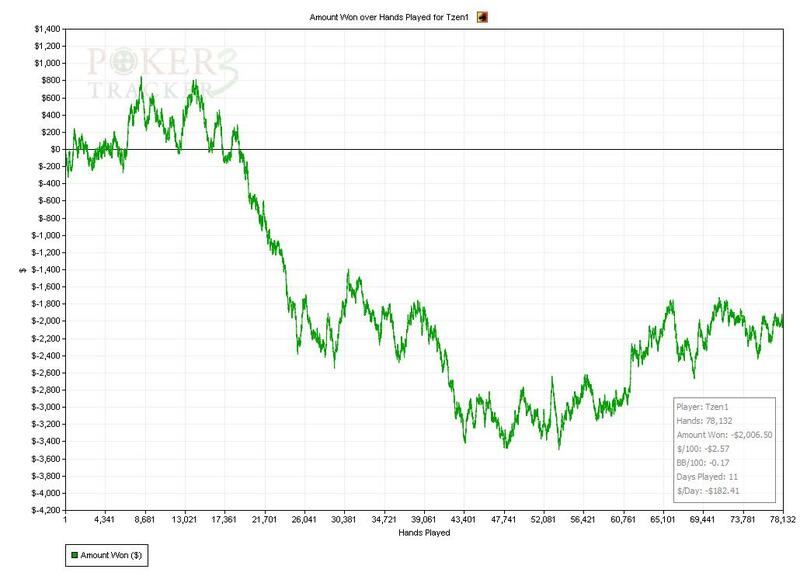 Earning VPPs went very fast playing those medium stakes and I knew that I could put in the volume to become SNE. 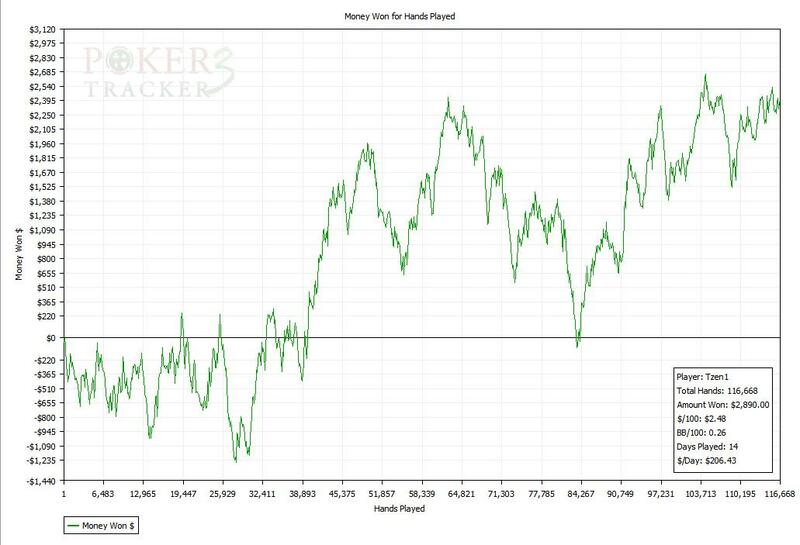 I actually estimated my SNE based on playing $10/$20 tops just to be on the safe side. I estimated playing 10% $10/$20, 40% $5/$10 and 50% $3/$6. Breaking even would give me $79.200 and I needed to play 25 hours a week (based on 45 weeks) for an hourly of $70,39. This didn’t include the extra’s like the two packages and the WCOOP Main Event Ticket. After the VIP changes were announced it was actually $1.200 more because of the Stellar Rewards and the changes for the milestone bonuses. My idea was to give it a shot in January to see if I could put in the volume that was needed. Since my girlfriend was away for the first 5 months of the year my idea was to give myself a headstart, take it easy during the summer and pick up the volume again at the end of the year. I expected to actually win money on the tables since I did so since 2006. 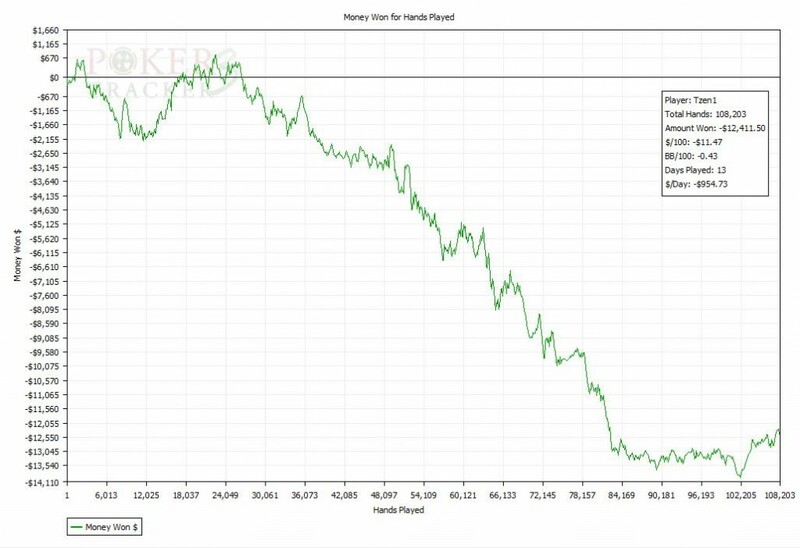 My idea was that I would probably learn something from playing this much and sure the long grind would affect my winrate a bit but I still hoped to win $10k/$20k on the tables. Since I could use the motivation I started this blog and a topic on the Pokernews NL forum. If you want to achieve a goal it’s best to write it down and to keep track. For myself it works even better if I share my goal with as much people as possible. I just don’t want to fail after telling everybody that I was going to be a SNE at the end of the year. What also really helps is the encouragements from people during the year. At the moments that I lost shitloads of money on the tables people were still rooting for me which was sometimes the only “positive” thing on a pretty negative day, week or sometimes month! Sure I wouldn’t blog if I didn’t like the attention from people and I would love to only tell how good I was doing, but after the first month I already had to write about the bad moments since January wasn’t how I planned it. I did put in enough hands and got almost 142k VPPs so on the VPP front everything was good. I continued in February but things only got worse! On the 22nd of February I played my last hand of $15/$30 and $10/$20. I lost $3,500 that day and I had enough of it. 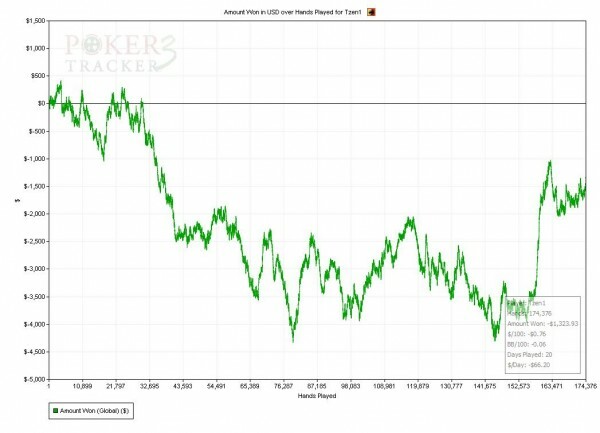 Dropping down in stakes would mean I had to play more hours, but hopefully I would win again since in February I actually lost money after rakeback! With 90k VPPs I was still doing good on the VPP front. 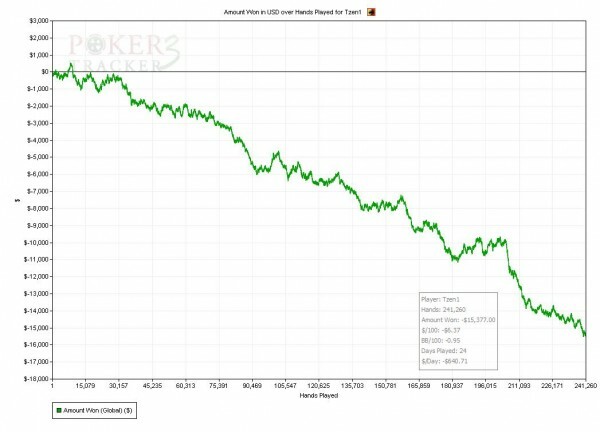 So in March I mainly played $3/$6 and $5/$10 and everything was sunny again. I won some money that month and got 80k VPPs. That was less then the two previous months but I earned a lot less VPPs/Hour so it was expected. April didn’t go as well as March did. I booked a small loss but again 80k VPPs. I also cycled the Amstel Gold Race that month which was an awesome experience and I’m going to ride it again in 2011. May already! There are less $5/$10 and $3/$6 tables so I had to play more $2/$4 which was a pain due to the lower VPPs. 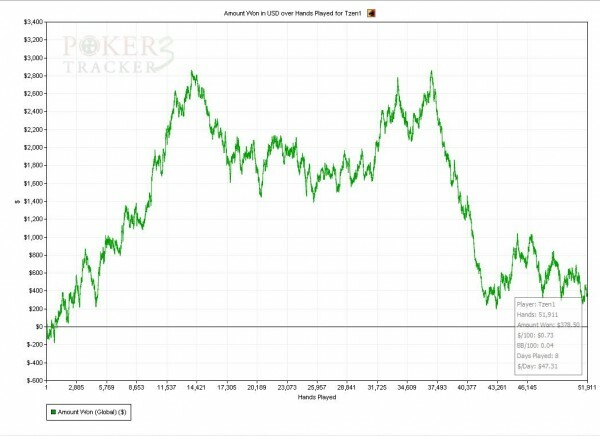 I book a small loss again and since my girlfriend finally got back I only made 60k VPPs. I was still ahead of pace and ready for a nice vacation. The worldcup ended in July, we lost the final for the 3th time. We didn’t deserve the win but still it would have been great! I was behind pace and summer had just started. Also the Tour the France started and I took a week off work to grind every day and watch the mountain stages. I actually got 83k VPPs in July which was a lot more then expected. There weren’t a lot of $5/$10 tables since it was summer so it was a long grind. 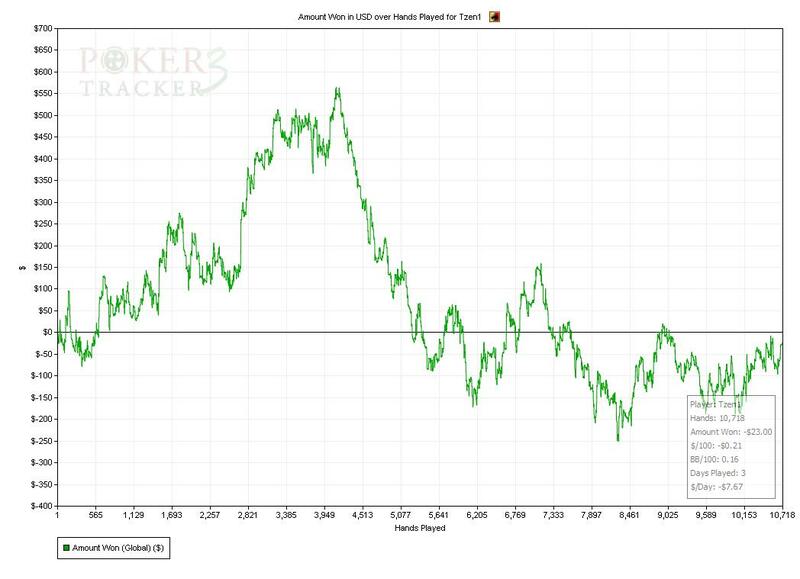 Again I booked a small loss, but overall I was happy with the results. I colored days I would play with red, days I couldn’t play with black (and noted why) and days which I had nothing planned I left blank. As soon as the day was behind me I colored it green. 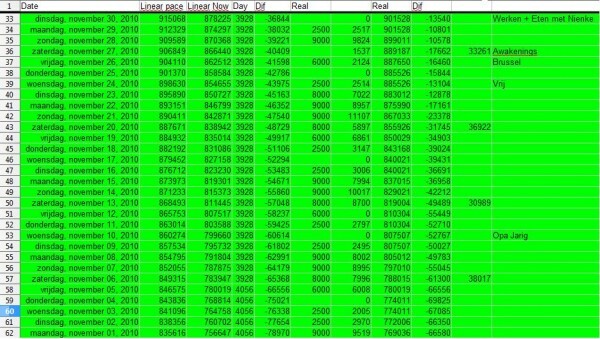 At the top of the sheet it should add up to 1.000.000 VPPs and in case I slacked a day I either needed to up the amount of a day I was already playing anyway (often not really doable) or had to color a blank day red. Stuff like just helps a lot, it makes it visible if you can achieve your goal or if you are way over your head. I wasn’t, but it would have been nice to win something in August. September was another great month. I first visited San Fransisco which was fantastic, then before going to Las Vegas we made a short stop in Los Angeles visiting Six Flags. In Las Vegas we stayed for 8 days and basically did nothing else then party. 6 guys a lot of alcohol and the best vacation I’ve ever had in my life. Celebrating my birthday in Las Vegas was the worst idea ever 😉 During the remainder of the month I got another 32k VPPs and booked a small win. 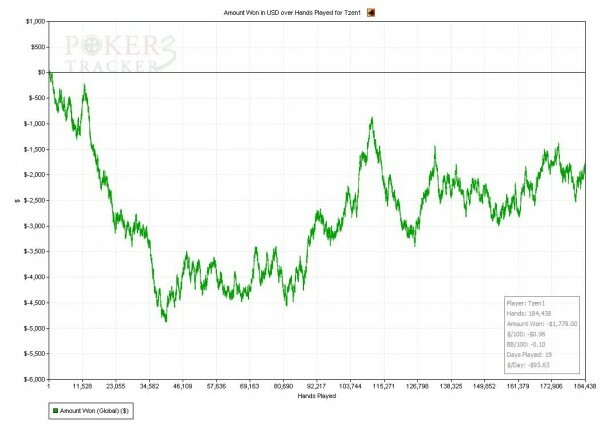 I planned to play a lot of hands during the last 3 months of the year. Each year since 2006 my best months were the last months of the year, probably because a lot of people are putting in a lot more hands to get milestone bonuses or just because it’s wintertime. I had to pick up the pace and did so but was 100k behind pace at the start of the month. Getting 107k VPP was okay, booking a small loss was fine getting SNE was by now a lot more important. I started the month pretty bad but recovered after changing my game so I was ready for November. 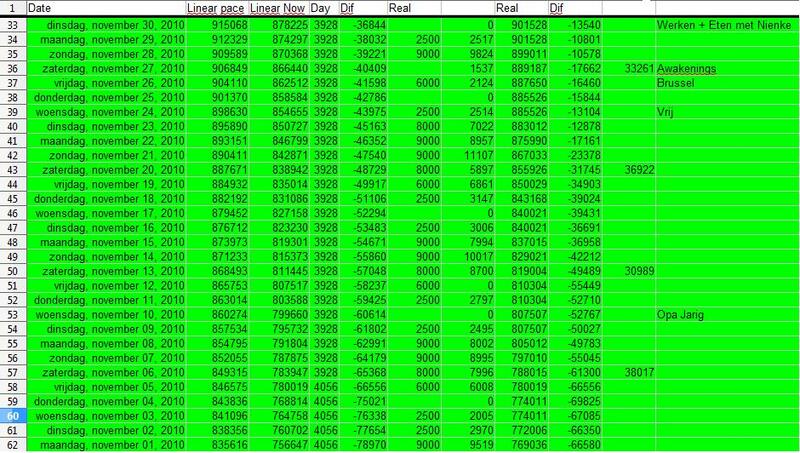 Since I didn’t want to risk not reaching SNE I had planned to get as many VPPs as possible in November. I would play 6 days a week, playing both Friday and Saturday evening/night as well and just lock myself in my house for 1 month to get back on pace. 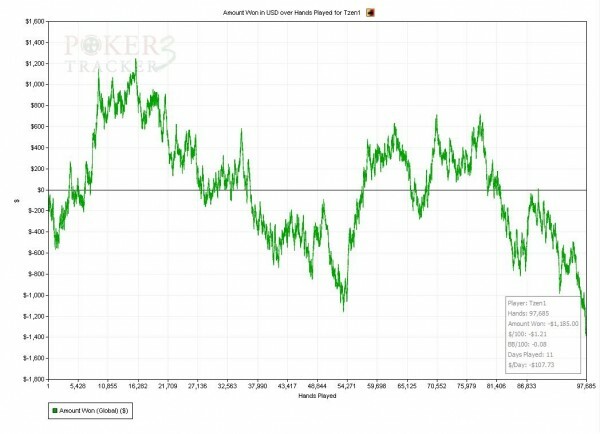 I didn’t want to leave things till December and with a good last 3 weeks in October I was ready to win some money on the tables as well. It wasn’t even close! 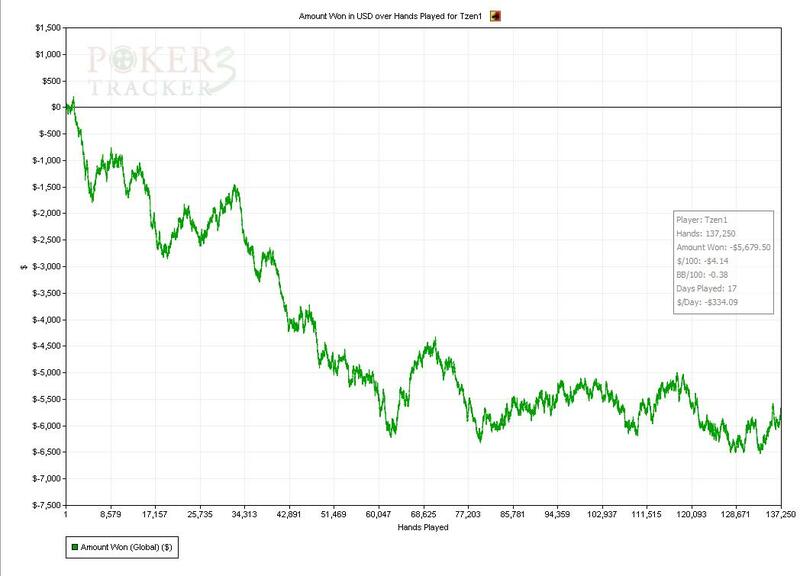 Check the graph, not even a chance…. I had the idea that I hadn’t changed a thing compared with my play in October but in stead of following the upward trend, it went downhill from scratch and I never recovered. Lost $15.377 without playing $10/$20 and $15/$30 was something I didn’t even know was possible. Getting 142k VPPs was good for the SNE chase but wow, just unbelievable! Somehow I started fresh in December. I was ready to finally get SNE, despite the losses. The start was okay, then it went downhill again but it wasn’t as bad as November. I had a chat with Joep van de Bijgaart(Pappe_ruk) via Skype/Mikogo about my game on the 22nd and just look at the graph to see what it did to my game. We just discussed some general Limit stuff, we didn’t go really deep but somehow it was an eye opener again. I’ve had these before, often when playing live when I have more time to think about my game but the session with Joep seemed to have helped a lot. At least it gives hope for 2011! The 29th of December was a special day. 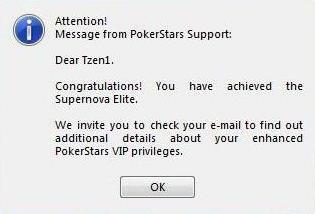 I saved up my last 261VPPs to play that day and I invited over my friends to celebrate my SNE status. My living room was filled with 15/20 people and I played the last hands together with my best friends. Most people had never seen me play so it was also nice to finally let them know what I’ve been doing all year long. I wanted to quit all tables just before the 1M mark and then play the last points on just 1 table. At 999.900 I unchecked the “Post blind” checkbox but the VPPs went a lot quicker then usual. Almost out of nothing the magic checkbox appeared! We popped a bottle of champagne and toasted together. I then opened a couple of $0,01/$0,02 tables to play some semi-blind all-in shove fest with the people from Pokernews NL who supported me the whole year. I actually won $11,57 which makes this my most profitable stake of the year 😉 My best pokerbuddy who I’ve been playing with for years and who will play the PCA gave me the best present ever. A king chess piece! If you’ve watched or read The Count of Monte Cristo you know why, else you should really watch it since I just love that movie. King’s to me! The party went on and after popping 5 bottle’s of champagne I was out, so we had to go outdoors to get some more. I didn’t expect I would be so happy finally reaching SNE. I hadn’t invited anybody till Sunday for my party since I wasn’t sure if it was really worth it but after 9 bottle’s of champagne and a lot of shots I can say I had loads of fun, thanks to all my buddies! The year is over and I got SNE as planned. I also achieved my cycling goals earlier in the year which is something I’m proud of as well. What I didn’t expect was to lose so much money during the year at the tables. 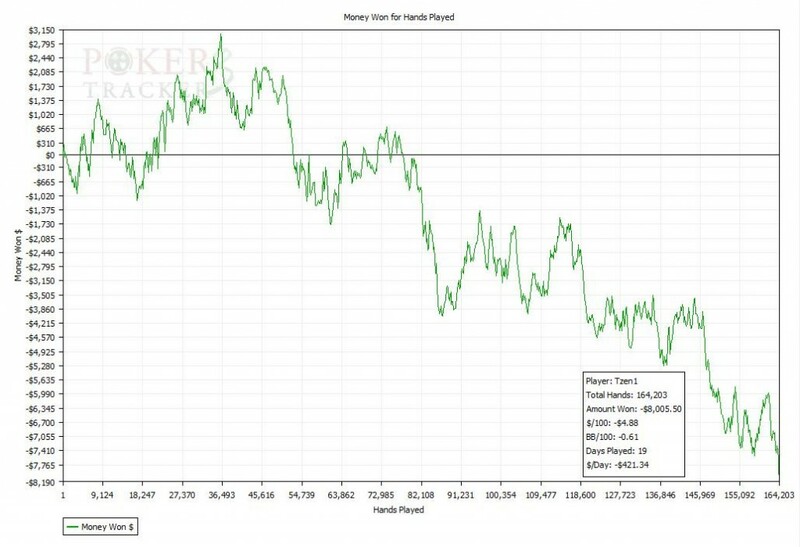 Because of the evil November month I closed the year with a loss of $44.625,93 in cash-games and a plus of $189,20 in tournaments and Sit & Go’s. As stated in the beginning of my blog I had planned to at least break even so to me it really feels like I lost about $44k. My hourly rate wasn’t even close to what I had expected as I played a total of 1180 hours to reach SNE. I’m really happy to be SNE but that was also partly due to the fact that otherwise my year would have really sucked. Would I have done it if I would have known this in advance? Probably not because nobody likes to lose that amount on the tables. Do I regret my decision to go for SNE, certainly not! Even with the losses I still made a lot of money due to rakeback. I didn’t have to rely on the money from poker anyway since I still have a job. And getting SNE one time in your life is at least special to me. 341 other people will get it this year, which is a lot more then last year but still a select few. Longest Single Session: 18.074 Hands in 11,85 hours on 22/11/2010 playing 1525,23 Hands/Hour earning 11.107,38 VPPs. 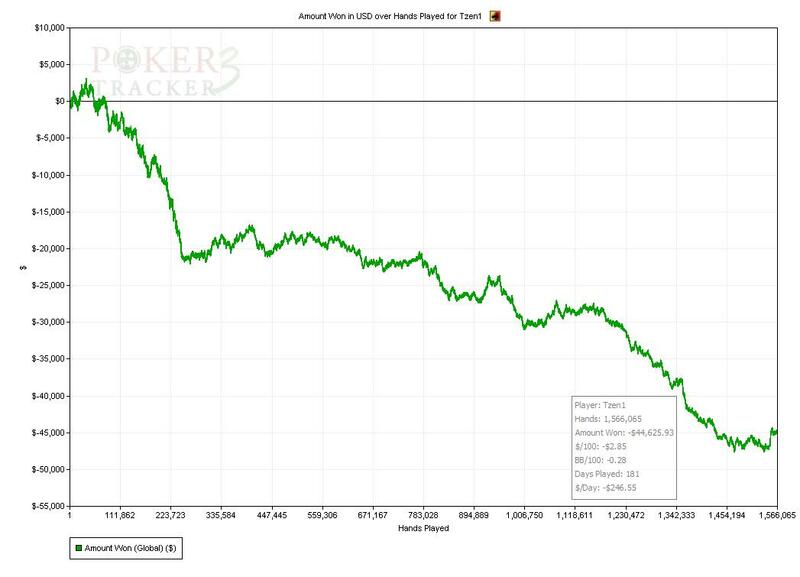 Worst Session of the year: -$3.383,50 on 21/2/2010 in only 5.579 hands. 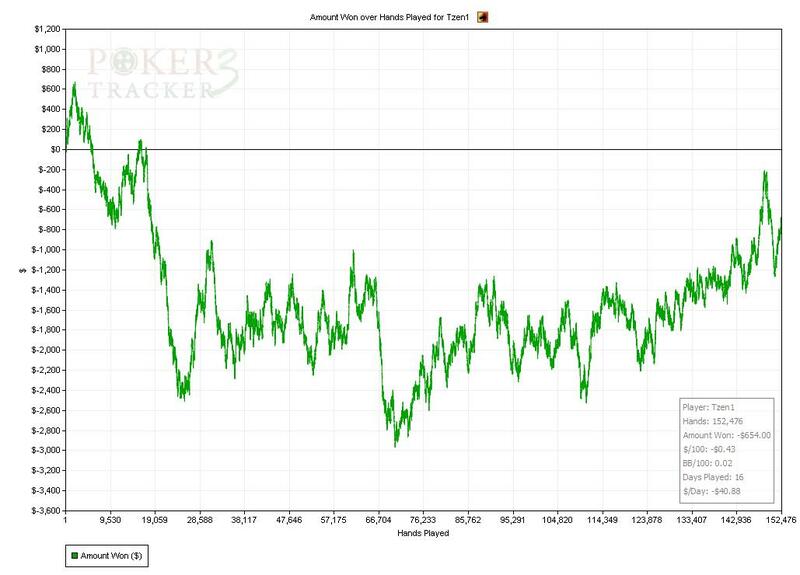 Most Hours/Hands played in 1 month: November with 172,73 hours playing 241.260 hands getting 141.966.06 VPPs. Thanks everybody for all the comments I got both on my blog, the Pokernews NL forum and 2+2. I wish you all a fantastic NYE and a wonderful 2011! Ik ben statistieken-freak, dus erg leuk om te lezen!